CrafTech Computer Solutions is an IT service and support company with two locations in Media and Aston Pennsylvania. 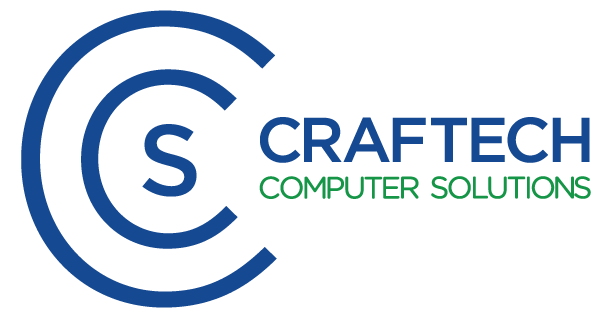 For over 27 years CrafTech has been serving the Philadelphia and Delaware County community with a range of computer, networking, and internet services. Some of these include professional IT consulting, proactive network maintenance, remote IT management services and network support, unified WiFi, cloud computing, VoIP phone setups, and much more! 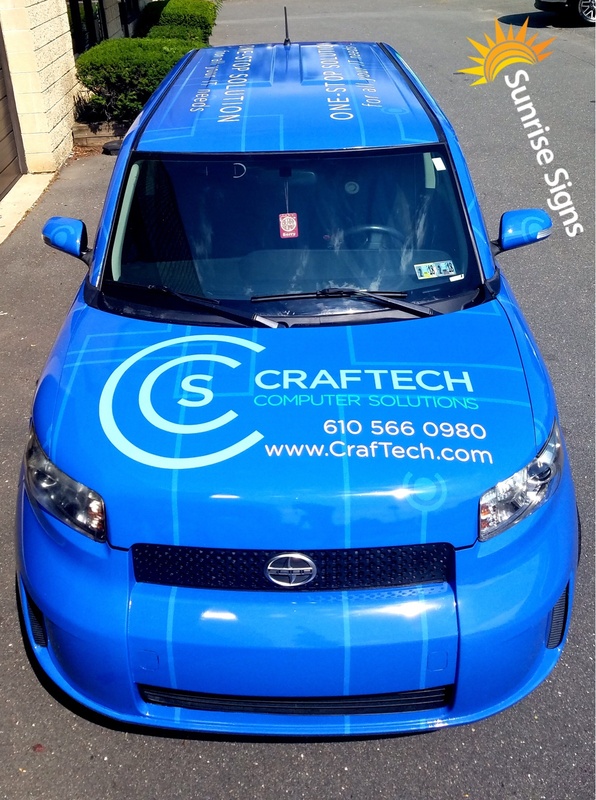 CrafTech had come to Sunrise Signs a few years ago to get a full wrap on their Scion xB. We blew them away with a full wrap design and installation, but after they changed their name and logo a bit, it was time to update the vehicle wrap as well. They gave us a call and we were more than ready to get their vehicle rebranded! 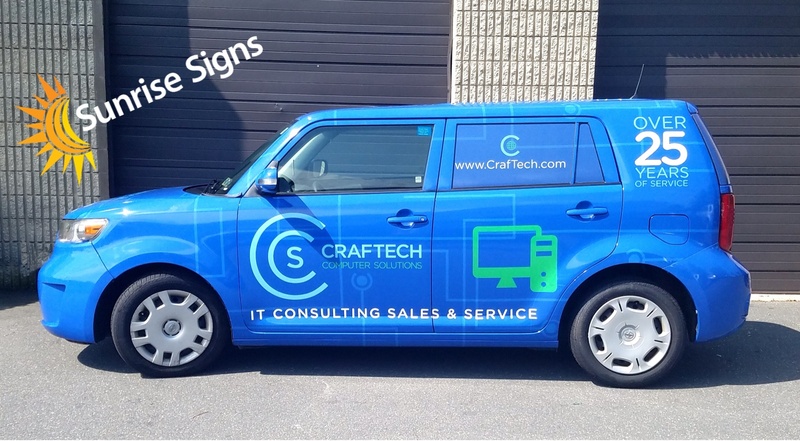 CrafTech’s graphic designer wanted to take a stab at the artwork this time around, so we worked directly with them to make sure their placement of the graphics would work on the body of the vehicle. We’re happy to use artwork provided by clients, but it’s important to make sure these flat designs translate effectively to the three dimensional body of a vehicle. What looks good on a computer screen might not always look good in the real world! After removing the previous wrap and adhesive, we were ready to get the new graphics installed. The vehicle branding is clean and to-the-point. With the essential information and sharp blue color, driver’s on the road will get everything they need from the CrafTech wrap design. 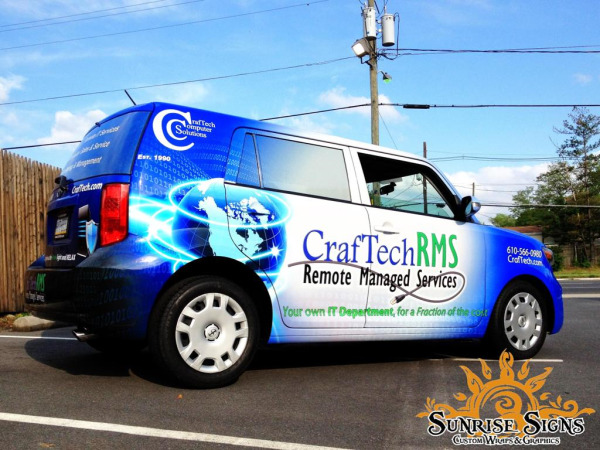 Our latex digital printers really made the blue base pop - when the sun shines on this wrap you won’t be missing it! ...roof wraps? We got you covered! This project was a complete, full vehicle wrap. Every exterior inch of the vehicle was wrapped from the bumpers to the roof. Perforated vinyl was used on the windows to allow their drivers to see outside, while still utilizing the space for proper branding. 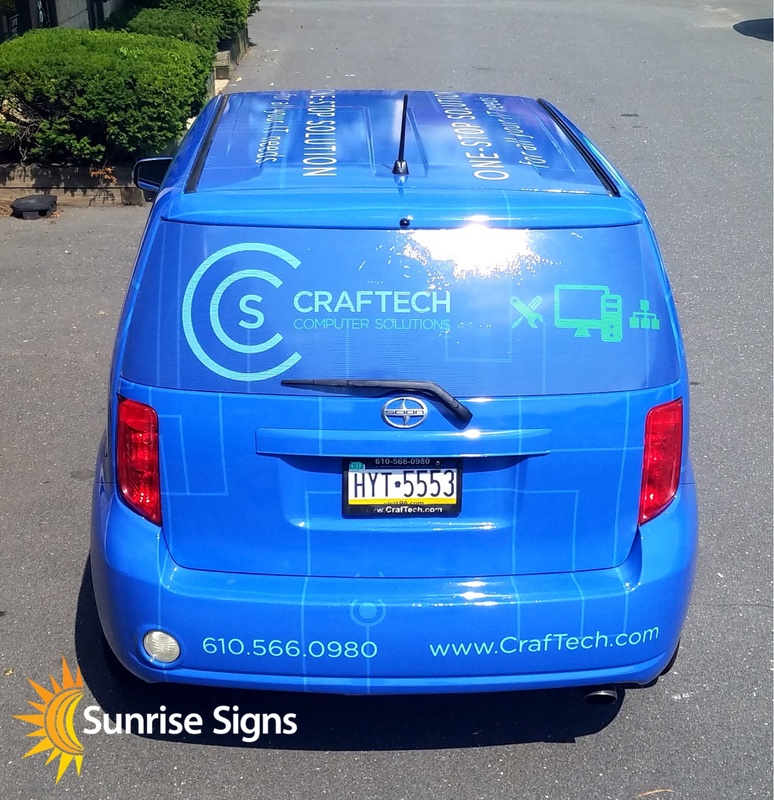 At the end of the day we had another successful vehicle wrap and another satisfied customer - and that’s what Sunrise Signs is all about! Got a new logo and need to update your vehicles? Ready to stand out from the competition with your own vehicle wrap? Tired of seeing you’re beat-up white van everyday?